Can you believe that the Oscars are just around the corner? That's right, on February 26th, the red carpet will once again be rolled out. Naturally, this means that you're also getting ready for your annual Oscars' party. Of course, like any party that is centered around film, you are going to need to ensure that you are well stocked with popcorn. However, since the Oscars are the fanciest thing about film, you can't expect to get away with everyday bagged popcorn. No way! This is the one night of the year when that popped corn needs to be as fancy, if not fancier, than those film starts you like to enjoy it with. So, to give you some inspiration and help you with your party planning, here are 12 ways to give your guests the best popcorn they've sampled all year long. We've said it before and we'll say it again: Bacon makes everything better. Especially when it's dressed up with bourbon and caramel. With a bag of this you're sure to feel like you're holding your very own Oscar. Get the recipe here. There is no better time to splurge on this indulgent topping than for the Oscars. After all, everything and everyone needs to be dressed like they're about to make an appearance on the red carpet. Get the recipe here. Who's to say you need to eat popcorn out of a bag? No one. After all, rules are meant to be broken. So tonight, let them eat cake. Get the recipe here. Have you ever had the corn from one of those little trucks that drive by construction sites and serve up the buttery-est, herby-est, most perfectly salted corn in creation? Well, if you haven't you need to ASAP because this stuff should win its own Oscar. In the meantime, here is the popcorn version of that experience to give you a taste of what you've been missing. Get the recipe here. If you went to high school in America you probably know what muddy buddy popcorn is. If you don't, now is the time to introduce yourself to every high school's MVP. This popcorn may be the ultimate indulgence. 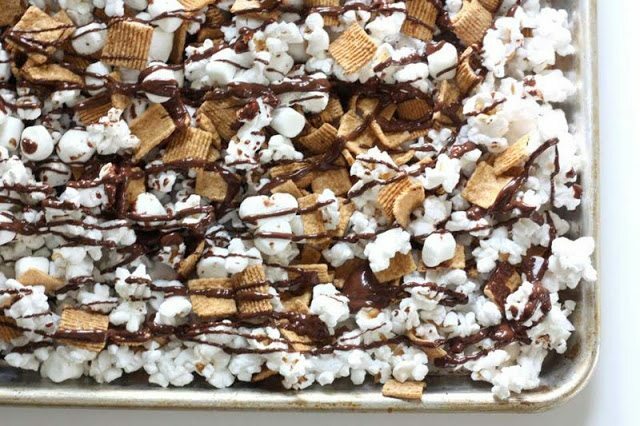 Loaded with chocolate and marshmallow, you may as well call this dessert rather than a movie snack. Is it black with white stripes or white with black stripes? It is a mystery few have solved, but one that is nevertheless as delicious as it is mysterious. If you don't like the idea of eating zebras so much, why don't you try some moose munch? Loaded with nuts, chocolate chips, and caramel, it is filling as well as satisfying. You know why it's called a s'more? Because after your first bite you're going to already be asking for some more. Try it. You'll see. When you really want to break from convention and do something wild, try substituting the corn in popcorn entirely. Try chickpeas instead. Crunchy, spicy, and satisfying, they may even win you an award for most innovative adaptation. Spice things up and add some red accents to your Oscar fest with this thai curry popcorn. Loaded with chili, lemongrass, and other spices, your mouth will be tingling in anticipation for the next bite. Matcha is always a good idea. In the case of popcorn, it's earthy, energizing flavors will pair superbly with the smooth sweetness of white chocolate to utterly captivate your senses. Just don't forget to pay attention to the awards ceremony.